With just two more courses to take to complete her master’s degree at GCU, Marian Barry could have participated in graduation ceremonies on campus in May. But that just didn’t feel right for the 58-year-old Mesa resident. So, nearly three months later – with her master’s requirements now complete – she decided to have her own graduation ceremony. She purchased her cap and gown, found out when her actual diploma was mailed, and then … she waited. Each day, she checked the mail for her hard-earned certificate of accomplishment. On Aug. 2, when it came, she had a favor to ask her mail carrier. 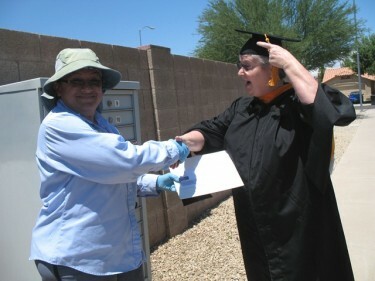 Marian Barry accepts her GCU diploma from her mail carrier during a makeshift graduation ceremony. Barry had her 83-year-old mother, Joan, snap a photo of the graduation ceremony (“I had to coach her; her hands are a little shaky and I knew we only had one chance at this”). Then the commencement, on a 112-degree day, was complete. Barry works as a clinical education specialist at Banner Ironwood Medical Center in San Tan Valley. She decided to pursue her master’s degree in nursing leadership after GCU officials came to the hospital and outlined the necessary steps. She was able to take the first two classes at the hospital, then completed her degree online. Barry was so enamored with her online experience at GCU, she now wants to become part of the process and has applied to be an adjunct faculty member with the College of Nursing. She now has the diploma – and a photo – to prove it. What a great story. Very cool! Absolutely the best thing I’ve seen all summer!! Way to go graduate number 49,487! That is so awesome!! Congratulations on your achievement Marian!! Go, Mare! You are truly awesome! So proud of you! Congratulations! You are an inspiration to me and thanks for reminding us that it is never to late to continue our education. Great Job!!!! Your never too old to learn something new! Way to go Mariam! !So proud of you! !You have proven to us that education has no age limit and continuous learning keeps us in line. Way to go Marian!! I may be holding my own graduation here in Michigan myself! Way to go Marian!!! I can’t wait for my big day, and you’re right, you’re not too old to continue your education. I’m 58 as well and striving for my Reading Specialist certificate. WOW, way to go Marian! I am so inspired. I am doing my RN-BSN at GCU and am loving the experience. I will turn 56 next month and it is great to see that I am not alone. Thank you. Congratulations! Your story is so enlightening! I will be sharing it with everyone I know. Goodluck! I loved your graduation photo. Sometimes the least amount of fanfare leads to the greatest memories in life. I am proud of you and your accomplishments. Congrats! We are never too old to give or receive God’s blessings. It sounds like you would make a great nursing educator. That was awesome! Very inspirational! Congrats Marian, I’m real proud of you. I started to college at GCU online at the young age of 74. Now I am still going. This is a great story! I love that you gave yourself a ceremony and recognized your accompliments. Marian, you are inspiring. I am also a recent online class student. I just completed my M.Ed.TESOL (Teaching English to Speakers of Other Languages)and am hoping to attend graduation at GCU in May 2013 to walk with my class. I am waiting for my diploma to arrive this coming week or the following.